At Avery Animal Clinic, we have a fully-equipped pet surgery center with an experienced veterinary surgical team. We are also one of the few animal hospitals in the United States that offer such technologically advanced, minimally-invasive endoscopic animal surgery techniques. In fact, the equipment we use is the same type used at human hospitals. Our equipment and skills make it possible for us to do the same surgeries with tiny incisions that are typically done with long incisions. We can accomplish dog surgery and cat surgery with less pain, more precision, and shorter healing times. That means your pet can feel better faster. 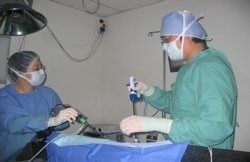 Here are our surgeons, Dr. Han And Dr. Park performing a laparoscopic spay and gastropexy. Avery Animal Clinic is one of few clinics on Orange County that have the capabilities to perform a laparoscopic spay and gastopexy. Our Avery animal clinic surgery team provides laparoscopic surgery. This means that instead of making a long incision to do an abdominal pet surgery, we make two or three very small incisions of no more than a centimeter. Then we insert a tiny camera attached to a long rod into the surgical area. This camera displays a sharp, magnified image of the surgical area onto a television screen. This is an even better image than we would be able to see with our own eyes and a large, open incision. 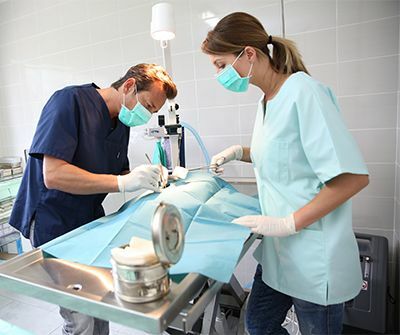 There are several advantages to minimally invasive dog surgery and cat surgery. Because the incisions are so small, they cause less pain and heal faster. It is also easier for pet owners to keep the smaller surgical wounds clean at home than the bigger ones. This leads to fewer post-surgical complications such as infections. Laparoscopic pet surgery also disturbs fewer of your pet's internal organs and structures to accomplish the same surgical goals. That means there are fewer complications during surgery, again, leading to faster recovery time for your pet. We offer many types of laparoscopic animal surgery procedures, including minimally-invasive spay and neuter surgeries. For years, most spay surgeries involved removing both the ovaries and the uterus. For both dog surgery and cat surgery, this often came with risks such as endometritis, pyometra, and urinary incontinence. Our procedure removes only the ovaries, greatly reducing the risks involved, as well as shortening the healing time. In fact, to reduce the need for more surgeries in large breed dogs, later on, we can also perform a gastropexy at the same time as a spay surgery. This procedure attaches the dog's stomach to the abdominal wall to prevent twisting that could lead to deadly intestinal blockages. The benefits of smaller incisions and fewer disturbances to other tissues also extend to other types of surgery as well. Call us at 949-364-0730 for more information about our minimally-invasive surgeries for pets.